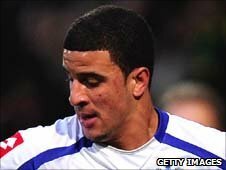 Aston Villa have signed Tottenham defender Kyle Walker on loan until the end of the season. The 20-year-old England Under-21 international had a medical before completing his move to Villa Park. On loan at QPR for much of the season, Walker will provide cover for first-choice right-back Luke Young, who has been troubled by a knee problem. "I'm excited about being here and proving that I'm good enough to play in the Premier League," said Walker. "That's why Tottenham bought me from Sheffield United and that's what I'm keen to show here at Villa." Villa manager Gerard Houllier added: "He will be a valuable addition to our defence." Inexperienced American Eric Lichaj, 22, and Carlos Cuellar, whose preferred role is centre-back, have been used to fill the breach. Walker impressed for Sheffield United before making the move to White Hart Lane but the form of Alan Hutton has restricted his first-team chances and he has spent the first half of the campaign on loan at Championship leaders QPR. Villa are struggling in the Premier League, only one point above the relegation zone, and have failed to keep a clean sheet in each of their last 10 league games - of which they have won only two. Assistant manager Gary McAllister admitted the Midlanders needed to strengthen their squad. "We are looking right across the board," he said. "Anyone who can make Aston Villa better, we are in the market for. As you can imagine, there is a lot of hard work being done in the recruitment area. "There are a lot of good players here but, at every club, if somebody is available that could make us better, we've got to be able to react." McAllister also revealed that Villa are still trying to identify exactly what is wrong with Young, who last played in the 3-0 defeat at Liverpool on 6 December. "Luke Young has seen a specialist. It is a tough time for him but work is continuing with the physios and doctors trying to get to the crux of the problem," he added.